My Trotskyite father hated everything William F. Buckley said. But he loved the way Buckley said it and always watched him, enjoying the style - despising the substance. Now, years later, I am an occasional contributor to National Review Online, something my father takes with a combination of pride, horror, and equanimity. I enjoyed his writing, although I cannot claim to be one of his legions of truly dedicated fans who drinks up each of his words. But I did have the pleasure of hearing him speak live, once. Now that he is gone, I appreciate that I had the pleasure of seeing something and someone quite special. On May 19, 1996 William F. Buckley Jr. delivered the commencement address at St. John's College in Annapolis, Maryland. I was partway through my graduate degree and attending commencement to cheer on many good friends. Like everyone who finds their way to St. John's I was somehow seeking the essential, the timeless - whatever that means. If I find it - I'll be sure to let everyone know. Buckley spoke to this desire. He noted that our civilization and its fundamental questions began with the Greeks and the Romans. In this age of more and more information (and this was years before Google became a verb) knowledge of their ideas is even more important because it gives people a common cultural vocabulary so that we can continue to understand each other. The speech, below, was delivered in a lyrical tone - more poetry than prose. Until I found it and read it this afternoon all I remembered was the refrain he used to punctuate his speech, "Even Homer nodded." He was reminding all of us that in studying the classics we are reminded of our inherent fallibility. It is a humbling thought and yet also, particularly in this mad wonderful time, a comforting one. From quite early on, beginning when I was 12 or 13, I heard my father say that he hoped his sons, of whom I was the third, would, when reaching college age, attend St. John's. This did not happen, my brothers opting for the geographically expedient Yale, only an hour's drive from where we lived. But my father's reverence for the idea that animates St. John's lingers in the memory, and later on I would read references to this college in the work of my father's friend Albert Jay Nock. Mr. Nock was not given to ambiguity, and if I remember right, at one point he pronounced St. John's the only college in the United States where a student could still receive an education. As I think back on it, his views on education were more complacent than my father's, who in a moment of exasperation with the modern curriculum told his ten children that, in America, either one went to college, or one received an education. Mr. Nock exaggerated, of course, but he would not be distracted from his main point, which was that any attempt at education that is not grounded in Athens and Rome is quite simply evasive. Because, he said, every subject that challenges the human curiosity and intimates the resources of the human mind is sitting there in the copious inventory left by ancient Greece and Rome. To ignore them, as most curricula now do, is to ignore the primary deposits of Western intellectual experience. Most educators would classify any such claim as exorbitant, and many even deal with it condescendingly: this is easier to do now that Mr. Nock is dead, because he knew very well how to bite back, in any of the five languages he had mastered. Critics will cite the huge events in human thought and experience that came after the fall of Rome. No matter -- St. John's is not here to deny the importance of what came after, which after all figures prominently in your own later curriculum. Albert Jay Nock was insisting on the indispensability of root knowledge, of what is learned only, he insisted, by knowing first what was thought and done between the time of Homer and Marcus Aurelius. But our mind then turns to the other end of the scale, to the proliferation of knowledge. HOW is it possible to keep up in today's world? The answer is that it isn't possible to "keep up," in any actuarial sense. Someone somewhere remarked that Erasmus was probably the last man on earth about whom it could more or less safely be generalized that he knew everything there was to know. By "everything" was meant everything in the Western canon. Probably that means that Erasmus was known to have read every book then existing in those Western languages in which books were written. Knowledge was finite in the fifteenth century, and so tightly packed that the entire Western library fitted into a single room in Salamanca. One still finds there, framed and hanging over the arched doorway, a papal bull of excommunication automatically activated against any scholar who departed that room with one of those invaluable volumes hidden in his vestments. Five hundred years later we are told that twice as much "knowledge" is charted with the passage of every decade. Suppose, by way of illustration, that at the end of every decade the penetrating reach of a telescope doubles. In that event you begin the decade knowing x about astronomic geography. At the end of the first decade, you know 2x; at the end of the second decade, 4x; and so on. All this is so primarily because of the multiplier effect of computerized explorations. On that question skepticism is dead, very dead. It was only a hundred years ago that George Bernard Shaw was told that the speed of light had been ascertained to be 186,000 miles per second. He replied that such a finding was either a physicist's effrontery or a plain lie. But we know now that raw knowledge has to increase. Pol Pot made a titanic effort to bring about nescience in Cambodia. His undertaking, twenty years ago, was to kill everyone who was literate -- excepting, presumably, those at his command who needed to decipher his instructions to kill everybody else who could read instructions. He tried very hard, killing almost one-third of the Cambodian population; but he did not succeed in his ambition, and no one will. The wonderful line from the Russian novelist Ilya Ehrenburg comes to mind here, that when all the world is covered by asphalt, somewhere a blade of grass will force open a crack, bidding its ineluctable way through to sunlight. The knowledge explosion, as we have come to refer to it, is philosophically accepted. With this acceptance comes a discreet resignation to live in relative ignorance, on a progressive scale. SO THEN the question peeks in at us: What is it that we are expected to keep on knowing? And what are the prospects in the years ahead of the survival of a common cultural vocabulary? If we mean to continue to talk to one another, don't I have to understand what you're saying if, to excuse an inattention, you remind me that, after all, even Homer nodded? To know this is different from knowing that the earth is round, that a day comprises 24 hours, or that the seasons follow one another. But can we assume that the computer programmer, master of his own discipline, will in a moment of frustration console himself by reflecting that -- even Homer nodded? It is fair to ask, Why remember this formulation? To which the reply is that there is no design here to forsake others, merely to give an illustration. Besides, the defense avers, with the ascendancy of myth-breaking science, we should cherish a formulation that reminds us of man's fallibility. The impulse to self-government, along with the exercise of the scientific method, wore down many encrustations. The belief in the divine right of kings began to wither on the overburdened wings of certitude. It was in the seventeenth century, the lexicographers tell us, that the phrase about Homer gained currency. If fallibility could catch up with Homer, how much likelier it is that we will err. Homer was the august poet universally regarded as unerring (the divine Homer). Yet it was before the time of Christ that textual explorations caught him up, in one case describing a ship in which he placed a rudder on the boat's bow end. It was Horace who wrote that "even excellent Homer sometimes nods." By documenting an imperfection in the excellent Homer, we are reminded of the comparative magnitude of our own errancy. A knowledge of individual fallibility nudges us on to accept the probability of collective fallibility, and -- indulge me, please, my glide pattern -- our mind then turns to such safeguards as government by laws, not men; to the concept of checks and balances; to human rights. And one is prompted to reflect that the knowledge of human fallibility may orient us to hunger after infallibility, which surely gives rise to the religious instinct. And this instinct acknowledges what some of us insist on calling "eternal verities." Your curriculum takes you from Homer to Flannery O'Connor in literature, and from Plato to William James in philosophy. You have trod the great highways and byways of Western culture and thus you have in hand the basic instruments of communication. Do not be overawed by what you have not learned. Everything over there, in the high galaxies of experimental science and indeed social surmise, is deracinated, except as it is rooted in what you have studied, and what you do know. What so many of us experience, even those who have never laid eyes on St. John's, is the special lure of this campus, and a feel of the serenity it continues to irradiate with its emphases on the initial struggle for knowledge, back when Thales first restated the quest for an understanding of man and his universe. You have every reason to be proud of what you have learned, and to be grateful to those who taught it to you, and to the parents who expedited your passage first into the world, then to St. John's. You will not easily be surprised, standing on the shoulders of the giants; and, as you experience commencement speakers who come and go, you will be reminded, as today, that even Homer nodded. So I just found a terrific blog ...Or Does it Explode? Inside the struggle for civil rights in the Middle East. Good stuff all around, but what particularly caught my eye was learning that Imad Mughniyeh's son Jihad appears to be a Yankees fan. Bronx Bombers suddenly takes on a sinister meaning. I'll leave it to some aspiring comparative lit prof to deconstruct the meaning of this in terms of cultural hegemony, post-modern irony, and globalization. My own interpretation is simpler. I've written before that the New York Yankees are evil. This seals it. Now to get cracking on a network graph linking Mughniyeh to George Steinbrenner. After Mughniyah: Will Hezbollah Retaliate? Long-time Hezbollah operations director Imad Mughniyah has been a seminal figure in the evolution of modern terrorism. He has links to Arafat and bin Laden, and is believed to have masterminded suicide vehicle bombings in Beirut, Argentina, and Saudi Arabia. His demise by car bomb in Damascus is just (and fitting). It is an open question as to whether or not it will prove to be a major body blow or inspire revenge attacks. There may be reason to worry, but it is also possible that this was the best possible time to target Mughniyah. Assassinating Mughniyah was an impressive operation. Israel (the most likely actor) managed to penetrate the notoriously difficult Hezbollah security network to get to Mughniyah and they carried out an operation in the heart of an Arab capital. Of course, many observers have noted that Israel’s assassination of Abu Jihad in 1988 was an impressive operation, but did little to stymie the First Intifada. Formal studies of the targeted killing strategy are sparse – it is clear that some groups decline when their leaders are removed (Aum Shinrikyo, Sendero Luminoso, and Action Directe – to name a few.) Other groups are damaged, but come back – such as Palestinian Islamic Jihad (PIJ), which was hobbled after its leader Fathi Shqaqi was assassinated in Malta in 1995. PIJ made a comeback when it became an Iranian proxy, closely allied with Hezbollah. Other groups are motivated by the death and capture of their leaders. Baader-Meinhof in Germany is one example. Hezbollah is another. On February 17, 1992, Israel assassinated Hezbollah’s Secretary-General Abbas Musawi. Hezbollah responded on March 17, 1992 by striking Israel’s Embassy in Buenos Aires, killing 29 and wounding 252. On May 21, 1994 Israel captured Hezbollah leader Mustafa Dirani and on June 2, 1994 Israel bombed a Hezbollah training camp in eastern Lebanon. On July 18, 1994 Hezbollah responded by bombing the Argentine Jewish community center (AMIA), killing 85 and wounding over 200. The key factors in whether or not a group will fold or adapt or retaliate after losing a top leader are the group’s strength, leadership, and adaptability. Unfortunately, Hezbollah is strong in every category. In raw numbers, they are believed to have hundreds of core members and thousands of affiliated members. Beyond numbers they have secure physical and financial bases. While Nasrallah is the Secretary-General and major face to the world, Hezbollah is run by a council and has replaced its leadership before. It is not a group that relies entirely on a major charismatic figure like Aum Shinrikyo. Finally, Hezbollah has proven its adaptability time and again – developing new tactics, expanding into new businesses, and developing new means to propagate its message, including a satellite channel and video games. Finally, Hezbollah has a powerful patron in Iran, which has advised and guided it since its inception. If Hezbollah and its patron have not prepared a deep bench of operatives to replace Mughniyah then they are very stupid. Does anyone believe that Hezbollah and Iran are stupid? While there is reason to believe that Hezbollah will try something, there are also mitigating factors. Potential Hezbollah targets are also adaptable, and the memories of 1992 and 1994 remain strong. In addition Israel’s demonstrated ability to penetrate Syria with virtual impunity could lead the Syrians to check potential Hezbollah strikes. Finally, Hezbollah itself may have to check any efforts at retaliation. Research I am doing at the University of Maryland modeling terrorist group behavior indicates that Hezbollah can be very sensitive to the political situation in Lebanon. They have learned from experience. In spring 1996 Israel and Hezbollah fought a bloody campaign in which many Lebanese civilians were killed. While Israel was held responsible, Hezbollah lost two seats in the elections later that year. The political situation in Lebanon is very delicate, and many Lebanese leaders are becoming increasingly critical of Hezbollah. For example, Druse leader and March 14 movement figure Walid Jumblatt recently called Hezbollah a “totalitarian party.” Hezbollah wants to maintain and expand its power in Lebanon, and to do so it cannot completely alienate important Lebanese constituencies. Taking these factors into account, this may have been an ideal time for the Israelis to remind their enemies of their capabilities and serve justice to one of the world's most wanted terrorists. Nonetheless, the prospect of a retaliatory strike cannot be ignored. If it comes, it will probably be outside the region. Direct attacks on Israel from Lebanon could invite retaliations in Lebanon which would isolate Hezbollah even further in the current Presidential stand-off. Israeli institutions worldwide will undoubtedly be on high alert. Hopefully Jewish communal institutions and U.S. military bases (the other favored Hezbollah targets) will also tighten security. One thing is certain. This attack does not put Hezbollah out of business and it will undoubtedly review its internal security carefully and identify how crucial information about Mughniyah’s whereabouts leaked. About 35 years ago, Fatah faced the same problem of protecting its leaders from Israeli assassins. The response was to establish an elite bodyguard that became known as Force 17. It was with Force 17 that a young Imad Mughniyah began his long and terrible career. Way back, what feels like two thousand years ago, I majored in Communications at Emerson College - I have a Bachelor of Science in Speech. Technically a BSSP, I always called it a "BS squared." Emerson was founded as a school of rhetoric and requires every student to take a core of speech courses such as Voice and Articulation, Public Speaking, and Oral Interpretation. As a columnist for the student newspaper I wrote an article defending this tradition. Many students hated these classes, which involved reciting poetry to the class and having a Professor criticize the students' elocution and pronunciation. In my article I interviewed one of the Professors who mentioned a survey taken where graduates admitted, decades later, that despite how much they hated these classes, the Speech program turned out to be very useful in real life. I am now living my words. As part of my work at the Laboratory for Computational Cultural Dynamics at the University of Maryland's Institute for Advanced Computer Studies I work on the development of CAGE: Cultural Adversarial Game Engine - a game that simulates operating in a different culture. The game requires a human voiceover at points and guess who was selected for the job? I cleared my throat, found my optimum pitch, and made sure I had an open throat. Early reviews have been good. The massive rallies against the FARC earlier this week (between 500,000 and two million people rallied in Bogota, along with parallel rallies worldwide) were a watershed in many ways. 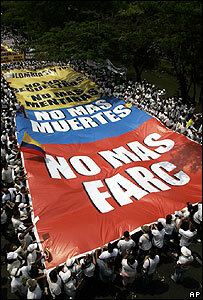 It was an indication of how low the FARC’s standing has fallen. Whatever legitimacy their critique of the Colombian government may have had in past decades has been decimated by their own brutality. Insurgencies feed off their causes, but the FARC is without cause. It also shows the maturation of Colombia’s democracy. Democracies need internal consensus about core issues and broad rejection of violence as a means of settling political disputes. Again, whatever the merit of FARC’s initial cause (Colombia – like much of Latin America – continues to suffer from massive wealth inequality), the people of Colombia recognize that armed revolution is not the response. Mobilization is a crucial element, not just in producing numbers of soldiers but, more important, in inspiring violence and crafting the account of the struggle. The information revolution is not just changing the way people fight, it is altering the way people think and what they decide to fight for. She calls for a counter-mobilization – not just public diplomacy. The rallies in Bogota and around the world is one example of the needed counter-mobilization.